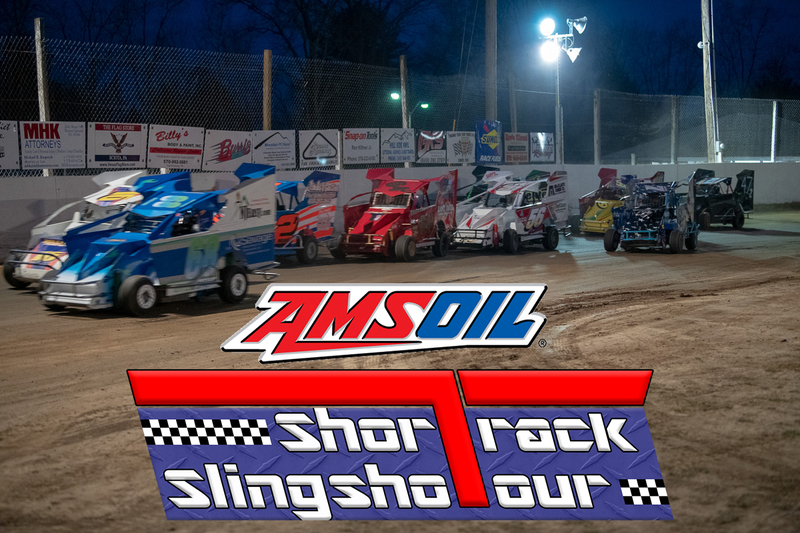 The Engines will be roaring this Friday Night at The Ville as Round #1 of the Amsoil Short Track Slingshot Tour fueled by Sunoco Race Fuels is going to start the 5 Race Touring Series featuring the AllStar Slingshot! Race #1 will highlight a 25-Lap Feature for the Slingshots with the winner getting a $300 Payday (Guaranteed) and $35 to take the green in the feature. The format of the race will be highlighted below. 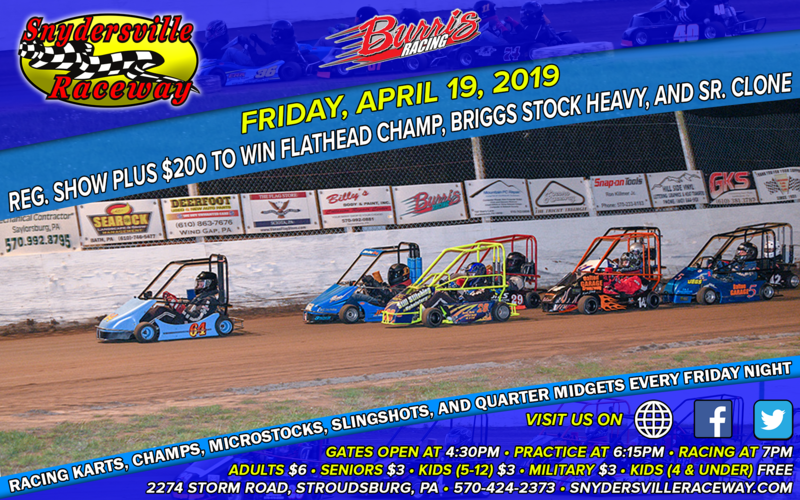 On top of that the highly popular Sr. Flathead Champ division will going for a $200 to win payday (5 Karts minimum) in a 20-Lap dash under the Friday Night Lights! 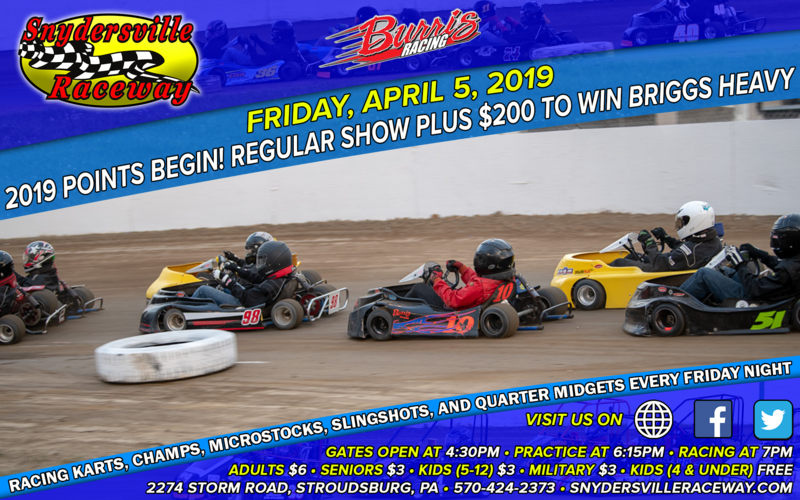 Plus we have a Regular Show of All Classes of Karts, Champs, Microstocks, Slingshots and Quarter Midgets ready to battle as the 2019 season points get underway. Come on out this Friday everyone and join us for some Exciting Action at Snydersville Raceway! Gates/Sign-In open at 4:30pm, Drivers Meeting at 5:50pm, Practice will begin at 6:15pm, and Racing will start at 7pm. See you all Friday! Racing cancelled for Friday, April 19. All Money Races to be rescheduled to later date. 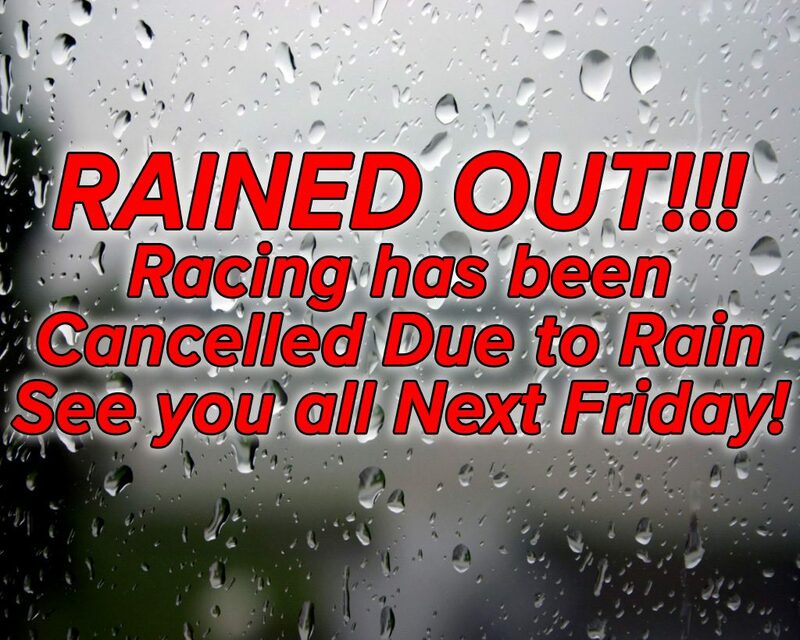 Due to the heavy rain and severe storms going to hit this evening, racing is going to be cancelled for Friday, April 19. All Money Races are going to be rescheduled to a later date which will be announced on Sunday. Have a great Easter and we will see you next Friday! Our Friday Night Opening race is going to be busy one as three money races are slated to take action on the 1/8 mile bullring! The Sr. Flathead Champs, the Briggs Stock Heavy Class, and the Sr. Clones will all be going for a $200 to win payday in 20-Lap Dashes this Friday, April 19. On top of that we have all of our Regular Divisions on the docket with Karts, Champs, Microstocks, Slingshots and Quarter Midgets ready to do battle at The Ville as 2019 Season Points will begin! Come on out this Friday and join us for some Exciting Short Track Action in the Beautiful Pocono Mountains at Snydersville Raceway! Gates will open at 4:30pm, Drivers Meeting at 5:50pm, Practice at 6:15pm, and Racing at 7pm. See you all Friday! Racing Cancelled for Second Week in a Row on Friday, April 12. Money Races to be rescheduled. For the second week in a row, Mother Nature is going to win against Snydersville Raceway. With impending showers and rain arriving this evening, the staff decided to cancel tonight’s racing for Friday, April 12! The Briggs Stock Heavy and Sr. Clone Money Races will be postponed to a later date in April or Early May (will be announced later tonight or tomorrow). Have a great weekend everyone and we will see you all next Friday (and pray we have no rain). 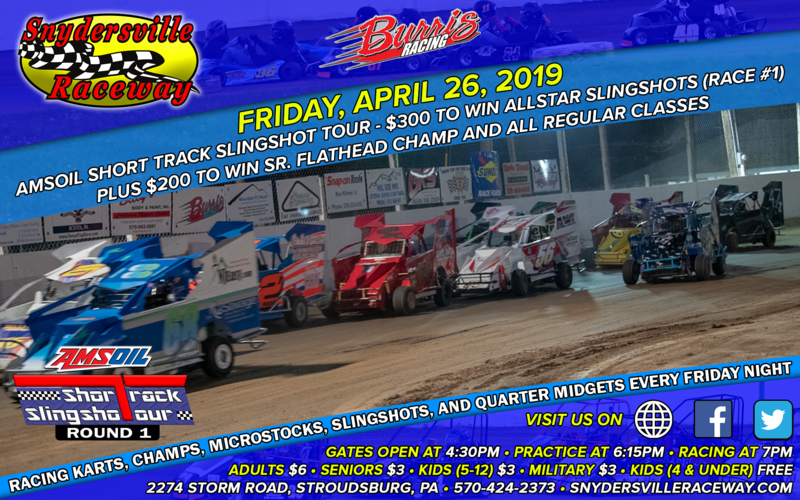 A new tour will be hitting the Pocono’s highlighting the AllStar Slingshot Division in a 5 race tour which will be featured at Snydersville Raceway and the West End Fair! Amsoil by Romeo Enterprises will headline the touring series and be putting up a Point Fund, Purse Increases, and Contingency Awards. To be eligible for a top 5 award the driver must 3 out of the 5 races. The purse for these races will also see an increase as $1000 will be distributed equally among the 5 races, which will add $200 to each race! Lastly, Amsoil will be giving away contingency awards at the Snydersville Raceway Banquet where the Top 5 in tour will be crowned! AllStar Slingshot Rules will follow what is posted in Snydersville Raceway’s Rule Book. Dust off those Slingshots and see if you can be the Champion of the Short Track Slingshot Tour! If there is any questions or you wish to put in additional sponsorship into the Tour, please contact Alex at racingpromotions1@gmail.com or message Snydersville Raceway on Facebook. See you all on the first race! Mother Nature will be racking up the first points for the year as racing for Friday, April 5 has been cancelled due to Rain. Our next race is Friday, April 12 with the first ever Invert Night! It will be a Regular Show with the Feature Lineups getting an invert of the top 0, 3, 6, or 9 (pending # of cars). On top of that we will have the rescheduled $200 to win Briggs Stock Heavy Money Race and the $200 to win Sr. Clone Money Race. Have a great weekend everyone and we will see you at Oreville Kart Club on Sunday or next Friday Night at The Ville! After an exciting Saturday show at The Ville, we are shifting gears into the Friday Night Lights. 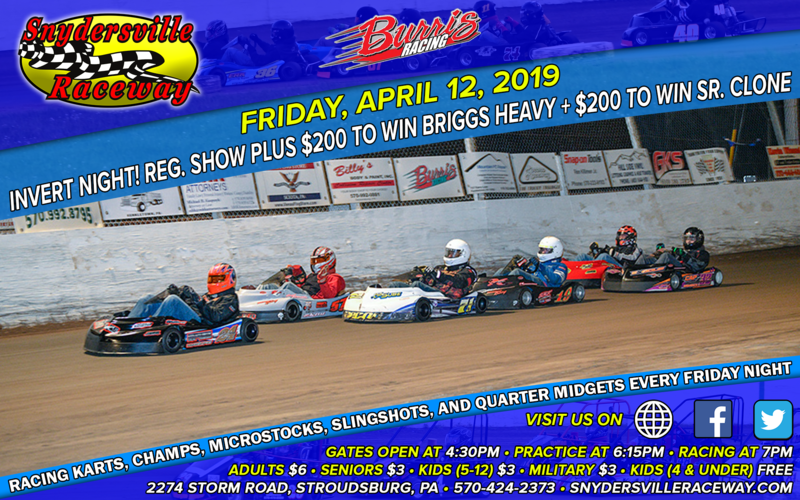 Our first Friday Night Show will highlight the Briggs Stock Heavy division as they will be going for a cool $200 to win in a 20 Lap Showdown. On top of that our 2019 Championship Points will receive the Green Flag as All Classes of Karts, Champs, Microstocks, and Slingshots will begin battling for the coveted Division Championships and Overall Championships. Come on out this Friday everyone and join us for some Exciting Racing Action on the 1/8 mile Bullring “Where It’s Dirt Racing at Its Best!” Sign-In will now open 4:30pm and go till 6:30pm for Pill Draw, Drivers Meeting will be at 5:55pm, Practice will begin 6:15pm, and Racing is slated to start at 7pm!